In 1932, the 20-month-old son of living legend and pilot Charles Lindbergh was taken from his parents' home in Hopewell, New Jersey. Over the next few months, the kidnapper left an astonishing 13 handwritten notes! Those notes helped convict Bruno Hauptman who eventually was executed for the baby's murder. The FBI lifted the letters in Hauptman's name and cut out the letters to form a signature. When compared to his actual signature, it was nearly an identical match. Interestingly, that handwriting comparison was the first major test for the FBI's newly-created crime lab. On July 4, 1956, 20-month-old Peter Weinberger was kidnapped from the front patio of his parents' home in Westbury, Long Island. His mother had placed the baby in his carriage while he slept. The kidnapping terrified Americans because, unlike the Lindberghs, the Weinbergers were not well known and not wealthy. They were a typical middle-class couple living in a supposedly safe suburban community. Left in little Peter's place in the carriage was a ransom demand for $2,000. 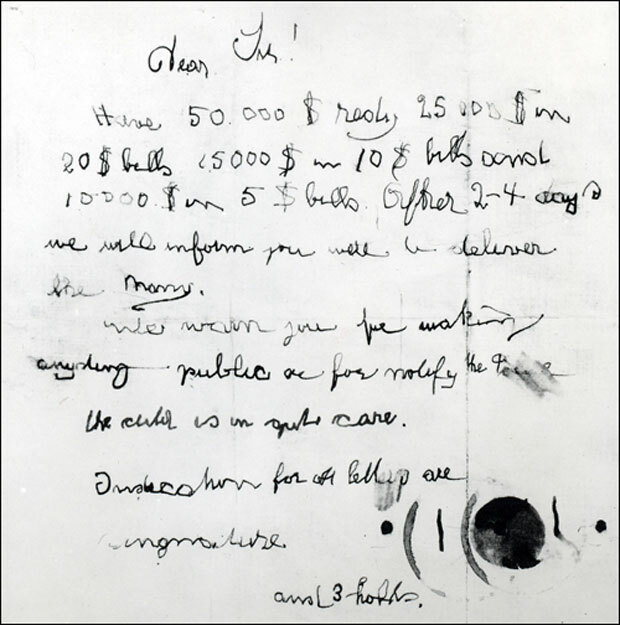 When the Weinbergers did not pay off the reward the following day, the kidnapper sent a second letter. In those days, by law, the FBI had to wait seven days before getting involved in a kidnapping case. After the Weinberger case, President Eisenhower signed a revised law reducing the waiting time to 24 hours and today, there is no waiting period for child kidnappings. Following the seven-day waiting period, the FBI gathered dozens of agents and trained them in handwriting analysis. They then began inspecting two million handwriting samples from the New York State Department of Motor Vehicles, federal and state probation offices, schools and other officially filed documents. Incredibly, after a month of inspection, agents came up with a match - Angelo LaMarca who was on probation and lived near the Weinbergers. He was arrested and confessed and then told agents the location of the baby who'd been killed. Like Bruno Hauptman, LaMarca was executed. This was the note left behind with the body of 6-year-old JonBenet Ramsey, who was found murdered in her parents' Boulder, Colorado, on Christmas Day in 1996. The case was sensational - a beautiful child, wealthy parents, a picture-perfect town and that mysterious ransom note. The ransom note was a lie. Whoever signed the note - and it was signed S.B.T.C. - said that JonBenet was safe and sound when in fact she had already been murdered and her body was in the house's basement. And then there was that demand for $118,000, an odd figure that happened to be the amount of the bonus received that year by JonBenet's father, John. The handwriting on the Ramsey note was examined and discussed over and over by "experts" who claimed Patsy, JonBenet's mother, wrote it, therefore she was the killer. Both Patsy and John Ramsey lived under a cloud of suspicion for years but eventually they were cleared of having any involvement in their daughter's murder, a crime that remains unsolved. On April 3, 2008, millionaire business owner and family man Tom Wiles opened this e-mail demanding $750,000 for the safe return of his 26-year-old son, Robert. The note was signed, "Group X." Robert had been working at the Wiles' family business, National Flight Services. Robert was a rising star, working in the Lakeland, Florida branch. He was last seen in his office before he vanished. Despite being warned not to contact authorities, the Wiles family brought in the FBI immediately. Against FBI advice, the family wanted to pay the ransom - a significant amount that meant something to the family. So the FBI set a trap for "Group X." To find out what happened next, watch "48 Hours Mystery: Ransom"